We are sad to be selling our beloved Leela who has taken us on myriads of adventures throughout the Pacific Northwest these past 4 years. Leela is a Union 36, hull #4. Built in Taiwan in 1977 she is a traditional, full keel, double ender, heavy displacement boat loaded with beautiful teak through and through. She turns heads at all anchorages and she captures the quintessential romantic feeling of traditional sailboats. She has an incredibly gentle motion at sea and gets going like a freight train when the wind is greater than 15 knots. Items to Note: Engine is original Universal 5432, runs great. Never causes issues. Head Gasket replaced 2017. Injectors replaced 2011 New diesel tank 2015 House bank batteries new 2015 Standing and Running rigging all new in 2008. Best mast, boom, and overall rigging we have ever seen on a boat of this type Sails Leitch McBride new in 2008 Bowsprit new 2008 Hydrovane Self-Steering. We use it all the time, even when sailing in local waters BBQ, Fiberglass Propane Tank Cockpit Teak Decks removed and reglued 2015 Side and Front Teak Decks all screw holes plugged with GFlex epoxy 2015 Head area completely renovated. New head, new gravity discharge holding tank, new lavatory, new high-quality low odor hoses 2017 V-Berth rebuilt 2017 Gennaker, new 2015 80W SolarPanel 2008 Etc Please refer to our boat blog at http://leelalife.com/ for detailed information on the boat projects and adventures aboard Leela since 2018. You can also view our blog filtered by boat projects and repairs at http://leelalife.com/category/projects-repairs/ Why we are Selling: We are selling Leela as she is meant to be sailing the oceans of the world and we’re in no position to do this at this time. We purchased Leela as we thought we were going to take her around the world. Too young and naïve we were, we quickly realized we didn’t have the experience or the funds to carry out that dream! As we’re not quite ready to sail around the world, and being stuck in Vancouver for the time being, we are begrudgingly selling her to a next owner who will inherit a sound vessel that has had tremendous upkeep and love in the last 4 years with us as well as the previous 8 with the previous owner Peter. We've also sold a business in the last few months giving us additional capital which will allow us to purchase the dream boat in the Mediterranean when the time comes. Leela is currently located on the hard in Bellingham, WA. This is where we have kept her every winter for the past 4 years as it’s less expensive than Vancouver. We can show and sell the boat in Bellingham, WA or move to Vancouver for a Canadian sale. 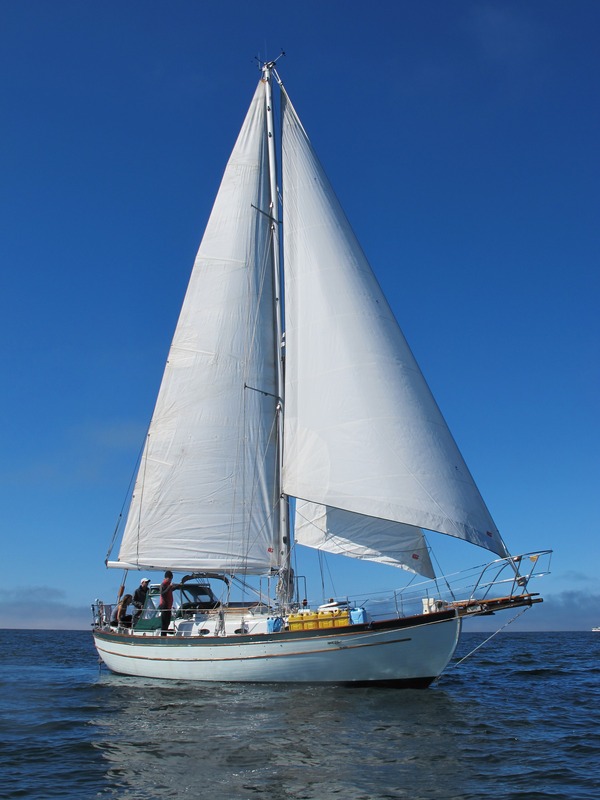 We are serious sellers who are selling a wonderful and well cared for sailboat. We are trying to sell without a broker first so we can both save broker fees. Please only contact us if you are serious about purchasing Leela. We are not interested in low ball offers or any trades whatsoever. Not included: Please note the Mercury dinghy and Suzuki outboard you can see in our blog are not included in the sale. The purchase of Leela includes a dinghy and oars. Dinghy picture is last in series. Looking forward to hearing from a fellow sailor who appreciates classic boats and will take good care of Leela into the future.